Good morning! So I thought I'd start to chronicle a little bit more in detail of what I actually do when I'm in my health rhythm and flow to see if you can pick up any swaps or ideas that might make your life easier and healthier. 6am: meditate (actually I'm doing a daily reprogramming by Lacy Phillips, see her website here, Free and Native) but otherwise I'd be meditating. 6:30am: Sunlighten infrared sauna session (I turned it on to heat it up before I meditated) sat in here, then used coconut oil and my fascia blasters to move stuff out of my lymphatic system. SWEAT and then Dalton came to get me and wanted to slap more coconut oil on my face :) My little helper. 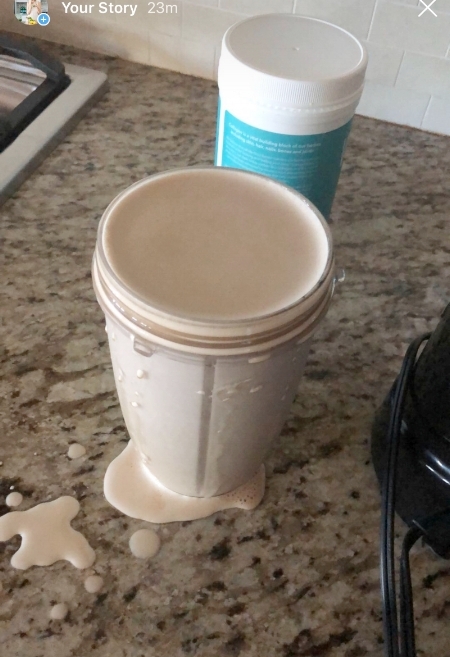 AND....it overflowed, because I had more liquid in my cup than usual. 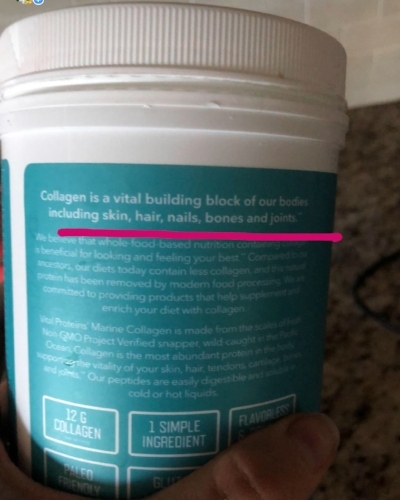 This is what happens with the collagen and YAY because just imagine what it does IN your body to help rejuvenate your skin and hair and nails, PS that is why I use this, not because of leaky gut nor do I have leaky gut nor is that how you heal leaky gut (if you have leaky gut go take my Food Rebel course lol). And now I'm off to get myself into the sun to walk or run depending on how I feel and ALWAYS ALWAYS ALWAYS first I put on my CounterSun by Beautycounter because duh it keeps me from getting brown spots (I'm working on my melasma right now using their awesome overnight peel) AND their sunscreen uses zinc as a mineral blocker, don't go using a sunscreen to protect yourself from the sun that is full of garbage chemicals and going straight into your skin and floating around and ending up making your liver slow down, K? Get your Countersun HERE like for everyday of the year. It's my number 1 beauty tip after drinking clean water, lots of it and eating high nutrient dense foods - like plants! Speaking of eating plants, you need to check out my new course, an ONLINE COOKING COURSE: Food Rebel EATS. I'm showing you all kinds of tips like these in a way that makes it easy for you to know what to buy, how to stock your kitchen and how to simple plant based meals together in FAST QUICK ways. I DO NOT MEAL PLAN and I don't think you have to either. So if you'd rather be at the pool or park or watching golf on a Sunday instead of cooking a bunch of chicken then go sign up now >>>>>> I want to know how to use more plants Jodi!! Is the Universe Using Food to teach you a life lesson?